As the major free sugar circulating in the blood of higher animals and the main source of energy in cell function, the regulation of the metabolism of glucose is of interest to researchers in the fields of Diabetes & Obesity, Endocrinology & Metabolism, and Sports & Exercise. LabChart, combined with the HD-XG glucose implants, gives you a way to record continuous blood glucose, eliminating the data gaps associated with manually obtaining glucose test strip measurements. For an all-in-one solution, the Glucose Telemetry Foundation System is an ideal base package for your combination of biopotential, glucose, activity, and/or temperature telemetry recordings in small animals. Continuous Glucose Monitoring - No more data gaps. Record, calibrate, and analyze continuous glucose telemetry data in real time and uninterrupted for long term experiments, using LabChart 8. LabChart's Glucose Calibration Extension allows continuous blood glucose, temperature, and activity data from freely moving mice and rats to stream from the HD-XG Glucose Implants directly into LabChart. Using the HD-XG implants in combination with LabChart eliminates data gaps and ensures that you get high-quality glucose data, unimpeded by stress artifact, so you can make fully informed decisions from a complete and accurate data set. With implantable glucose telemetry, researchers can now collect data for 28 days or longer while reducing animal stress and measurement variability commonly associated with glucose test strip measurements. 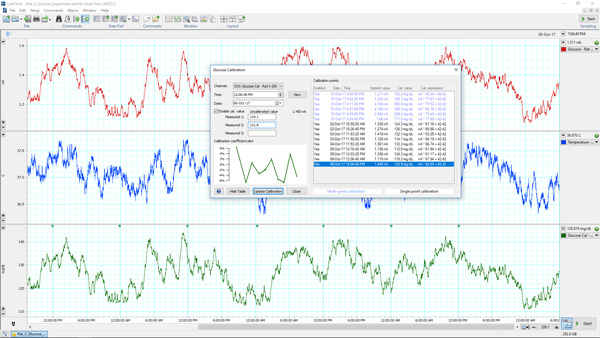 Continuous, high resolution telemetry data from freely moving animals can be collected, calibrated, and plotted in LabChart using the HD-XG Glucose Implants and LabChart's Glucose Calibration Extension. Pro Tip: How to calibrate data for glucose measurements. How to calibrate data for glucose measurements. Use your own glucometer to calibrate your data or one of ours from our Glucose Calibration Kit. You can calibrate during live data collection, or adjust your data after the fact with previously collected data points. Pro Tip: An all-in-one system for glucose monitoring using telemetry. An all-in-one system for glucose monitoring using telemetry. Existing methods of using test strips to measure blood glucose are labor intensive, stressful on animals and produce intermittent data. ADInstruments' Biopotential and Glucose Telemetry Foundation System provides researchers with an easy way to continuously stream glucose data from freely moving animals directly into LabChart software. Calibration and drift are also taken care of with the help of LabChart’s dedicated Glucose Calibration Extension. Calibrates glucose data from the HD-XG glucose telemetry implants to use with LabChart 8. The Glucose Calibration extension auto-detects Glucose Tolerance Tests (GTTs) and provides a simple user-interface within LabChart to add, edit or disable calibration points, displaying changes as they are made. Apply both automated and manual comments to your work as you go and mark important events such as calibrations, feeding, exercise etc.The comments feature provides a useful way to note information from glucose tolerance tests (GTT). Thank you for your interest in Glucose. Please complete and submit the form below and an ADInstruments representative will aim to get in touch within one working day. If you’d like to speak to someone immediately, office contact information is available from the contact page.